A mannitol salt agar test is used to isolate and identify the presence of Staphylococcus aureus in a clinical specimen, which makes it both a selective, differential, and indicator medium. Picture 1: Mannitol salt agar test as a part of a selective medium. On the left side grows Staphylococcus aureus and no growth took side on the right side. Picture 2: Mannitol salt agar test on three plates with corresponding results. Prepare the medium as directed by the manufacturer. It is best to use a ready to use dehydrated powder (the one readily available on most suppliers of culture media). The medium has a concentration of 11.1 grams in every 100 ml of distilled water. Sterilize through autoclaving at a temperature of 121 degree Celsius for 15 minutes. Allow the medium to cool down. Mix well before putting in a sterile petri dish. Put a label on the medium. Place the plate at 2 to 8 degree Celsius in a plastic bag in order to prevent loss of moisture. The medium can last for a few weeks provided no abnormalities in the medium’s appearance. Do not use the medium if there are any signs of abnormalities as they could indicate a possible contamination, alteration, and deterioration. Picture 3: Staphylococcus epidermidis on mannitol salt agar. Picture 4: Mannitol salt agar; the plate on the left tests negative while the one on the right tests positive. The primary purpose of mannitol salt agar is to determine or select bacteria that have the ability to grow in a high salt environment. If there is no growth after adding salt, it means that the microorganism is intolerant to salt. It differentiates and isolates Staphylococcus aureus in a clinical sample. It is used to identify Staphylococci in foods and dairy products. It is a part of the bacteriological examination of drinking water, spas, and swimming pool water. The peptones and beef extract present in mannitol salt agar supply all the essential nutrients for growth of the medium such as vitamins, nitrogen, minerals, and amino acids. A 7.5% sodium chloride concentration will result in the inhibition of species other than the Staphylococci. The addition of salt supplies the important electrolytes needed for transport and osmotic balance. 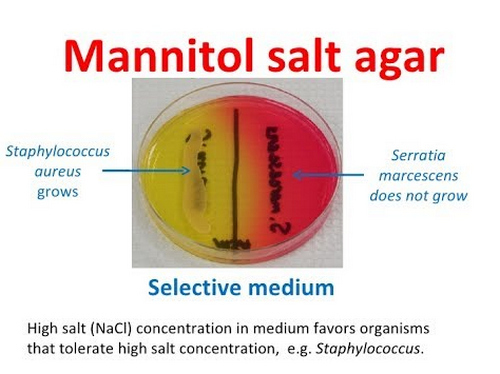 Why Mannitol is used in mannitol salt agar? There are different types of sugar but why mannitol is used in mannitol salt agar? The addition of sugar in the medium is used to find out if a particular microorganism can ferment sugar that is present in the medium. For Staphylococcus, mannitol is the right sugar to use. Other organisms have a corresponding type of sugar too such as TCBS where sucrose is used. 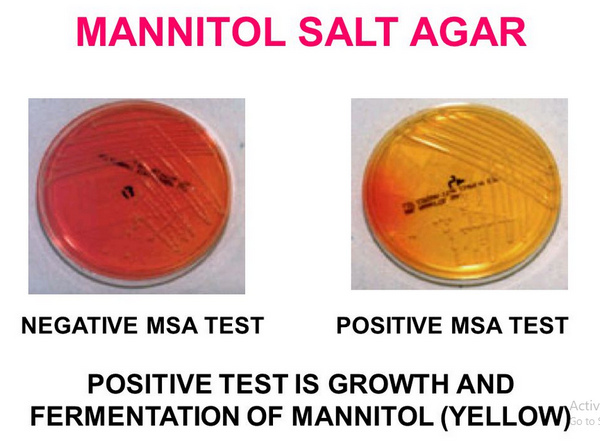 Differentiation using mannitol salt agar test is a must because not all Staphylococci are pathologic to humans. Pathogenic Staphylococci, the ones that cause a disease to humans have the ability to ferment mannitol. If a particular specimen contains Staphylococcus aureus, you can expect that it can easily ferment mannitol. The fermentation of sugar leads to the production of acid, which changes the pH of the medium to acidic. Yellow colonies with yellow zones – It indicates the presence of Staphylococcus aureus. Red colonies with red zones/Colorless – it indicates the presence of organisms other than Staphylococcus aureus, usually the ones found naturally occurring in the human body such as Staphylococcus epidermidis (found on human skin). No growth/traces of growth – It indicates the presence of Streptococci and gram-negative bacteria. Staphylococcus saprophyticus may have the ability to ferment mannitol. It produces yellow hallow around the colonies during mannitol salt agar test resembling with Staphylococcus aureus. Escherichia coli does not grow in the medium while Staphylococcus epidermidis has colorless to pink colonies. It is normally found on the skin of humans and does not cause any danger at all.